This week I transcribe a newspaper article from 1945 mentioning some cousins from Chicago. Glasses were raised to service stars of blue and gold yesterday in countless Chicago homes in tribute to the boys who bent the knees of the Nazis and the Nips. Her son, Sgt. Sidney, 24, who was wounded in the Battle of Aachen, was at home to rejoice with his parents. The others in service are Pvt. Oscar, 37; Pfc. Joseph, 35; Sgt. Ben, 32; Corp. Irving, 31; Sgt. Meyer, 20; Pfc. Julius, 27; and Pfc. Roy, 21. 1) My 2nd great grandfather, Selig Dudelczyk, had a brother named Julius who changed his surname to Odelson. Julius's son, Samuel had 13 children, including eight sons who served during World War II. 2) Note on copyright: The Chicago Daily News ceased publication in the 1970s. It was part of Field Enterprises, which was dissolved in 1984. Unable to figure out who the current copyright owner is, I am sharing this with hopes it falls within "Fair Use" guidelines. 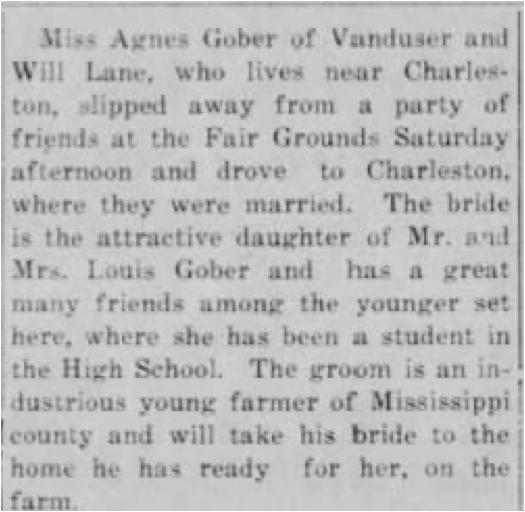 This week I transcribe a news article from the Sikeston Standard concerning Agnes Gober, the sister of my wife's great grandfather, Robert Gober. 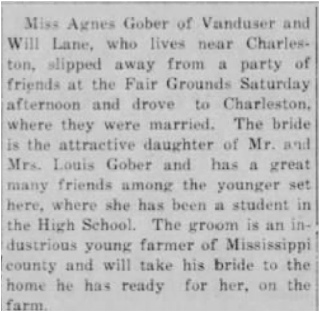 Miss Agnes Gober of Vanduser and Will Lane, who lives near Charleston, slipped away from a party of friends at the Fair Grounds Saturday afternoon and drove to Charleston, where they were married. The bride is the attractive daughter of Mr. and Mrs. Louis Gober and has a great many friends among the younger set here, where she has been a student in the High School. The groom is an industrious young farmer of Mississippi county and will take his bride to the home he had ready for her, on the farm. 1) Charleston is a city in Mississippi County, Missouri, and is about 15 miles from Sikeston, and 26 miles from Vanduser. 2) It sounds like the marriage wasn't a planned event - closer to an elopement. Their first child would be born 8 months, 19 days later. George William and Agnes (Gober) Lane had four children: William, Murray, Dorothy and James. This week I transcribe the obituary for Margaret (Watkins) Van Every (1842-1910), the third wife of my great great grandfather, Samuel Van Every (1820-1888). 1) My great grandfather, Melvin Van Every, was the son of Samuel and his second wife, Abigail Stuart. The other four children listed were Margaret's children. Samuel had a total of 22 children, and while many died young, more than these five survived in 1910. I suspect Melvin is listed because he remained in town, while other children of Abigail, and Samuel's first wife, Cordelia Hitchcock, lived elsewhere. In 1910, three of the four children of Cordelia were alive, five of the nine children of Abigail, and four of the nine children of Margaret. Mrs. A.S. Mooney is Pearl (1871-1958), Mrs. John Carleston is Myrtle (1877-1966) - after whom my grandmother was named, and Miss Nettie is actually Lettie (1881-1953) - She would marry Robert Collier in 1911. 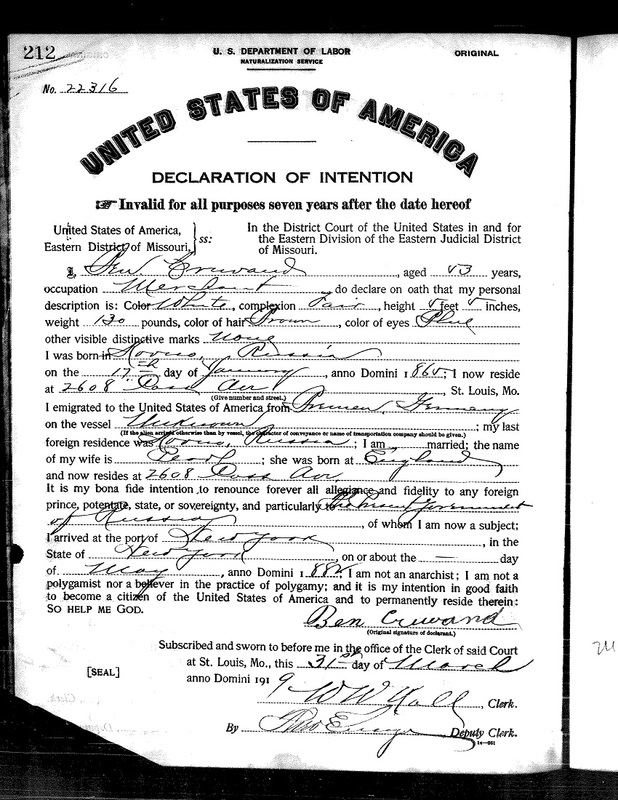 This week I transcribe the Declaration of Intention for Ben Cruvand, a first cousin of my great grandmother, Bertha Cruvant Newmark. I was born in Kovno, Russia on the 17th day of January, anno Domini 1865; I now reside at 2608 Cass Ave, St. Louis, Mo. I emigrated to the United States of America from Bremen, Germany on the vessel Unknown; my last foreign residence was Kovno, Russia; I am married; the name of my wife is Pearl; she was born at England and now resides at 2608 Cass Ave. It is my bona fide intention to renounce forever all allegiance and fidelity to any foreign prince, potentate, state, or sovereignty, and particularly The present government of Russia, of whom I am now a subject; I arrived at the port of New York, in the state of New York, on or about the – day of May, anno Domini 1882. I am not an anarchist; I am not a polygamist nor a believer in the practice of polygamy; and it is my intention in good faith to become a citizen of the United States of America and to permanently reside therein; SO HELP ME GOD. 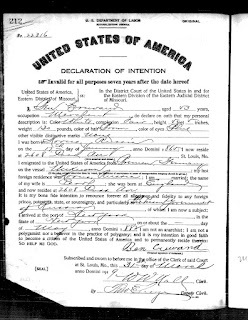 By [unreadable signature], Deputy Clerk. 1) Ben was the son of Samuel and Riva (Rosenblatt) Cruvand. Samuel was the brother of my second great grandfather, Moshe Leyb Cruvant. Ben was born in the town of Cekiske, in Kovno, Russia. Here he states that his wife, Pearl, was born in England, though elsewhere it is stated that she was born in Nashville, Tennessee. Which is uncertain. This week I transcribe a newspaper article from 1916 mentioning my great grandfather, Melvin Van Every, and his apiary business. Increase Total Hives to 2,635 – Business is Remunerative, Though Need for State Association And Selling Agency is Recognized. Goliad, Tex. Sept. 9 – The bee-keeping industry in Goliad County has been recognized for a good many years as one of the best money crops of this section. Blessed by natural vegetation readily adaptable to the culture of bees and the production of an excellent quality of honey, substantial farmers long since recognized the values to be derived from the industry. The growth of the industry has been substantial and at present there are within the borders of Goliad County 2,635 colonies of bees yielding on an average 125,000 pounds of honey. Though the price fluctuates from year to year and there is a pressing need for a state organization to foster the industry and promote selling agencies, several thousands of dollars annually are brought into the county from the sale of honey. 1) I include images where I had difficulty reading. CM Collier might actually have had 300 colonies, but if that's the case, I'm off a 100 in the other direction on one of the others, since they have to total 2,635. 2) I am reminded of one of Elizabeth Shown Mills' presentation on dealing with families with common names at the NGS Conference. One of her case studies included a list of names from a newspaper article, and she drew attention to the order the names were presented. They weren't alphabetical, or any other logical format. It turned out they were likely in the order the author of the article thought of them. Similarly, the listed apiarists appear to be in the order WC Collier placed them, not the newspaper, and while he does organize them by city, within the cities they aren't in alphabetical or number order. I'm more interested in whether the numbers are accurate. A 1910 article stated my great grandfather had 609 colonies, up from the 11 colonies he started with in 1903, and twice the 300 he had in 1907. If the number of colonies he had grew from year to year, how come he only had 550 in 1916? 3) WC Collier may have been accurate - for the Van Every apiary in Berclair. The 1910 article states he was moving 609 colonies by rail. The signature stated he was writing from Maxwell, Texas in Caldwell County. Where was he moving them too? Berclair? Did he keep some in Maxwell? I believe he may have maintained more than one farm, and thus possibly more than one apiary. 3) Melvin's sister, Lettie, married a Robert Collier. Looking for Robert in the 1910 census, he is a lodger in another Vanevery home, Pearl Vanevery Mooney. There are lots of Robert Colliers, but this almost has to be the correct one. Using the birth year from the 1910 census, In the 1900 census, we find likely siblings, but no William or any of the other initials of the Colliers in Goliad. So while they could be related, it's likely not closely.